I loves me a good pizza. This is one food that I seem to obsess over, relish and cherish in just about any format. I love thin crust, delicate Italian pizza. I love thick crust, greasy, Americanized pizza. I love anything in between. I'll eat almost anything on pizza (barring pineapple - sorry, just doesn't go). But I always love trying something a little different....a little off the beaten track. Something so plain and boring, that somehow it seems exotic and fascinating. While pizza here in Canada seems to be a little over-cheesed, over-sauced and overly meaty, other countries have such interesting takes on this classic pie. When I lived on my own in France, ordering a pizza was an indulgence for me. Cooking for one got old REALLY quick (particularly when your kitchen consists of a hot plate and bar fridge! ), so it was a great treat to order (and devour!) an entire pizza. Yeah, I know...bad. Anyway, in doing so, I got a chance to explore some rather different pizza combos......one of my favourites was the reine pizza, festooned with the simplicity of mushrooms and ham (can't go wrong there! ), but I discovered a truly amazing piece of pizza awesomeness. It was the pizza dauphinoise from Allo-Pizza. I initially ordered it because it was cheap, but then I continued to order it because of its sumptuous yumminess. The toppings are simple - oregano, potatoes, cheese, persillade and crème fraîche. And awesome pizza was had by all. Even hubs, who normally eschews my vegetarian pizzas for pepperoni-laden monstrosities, dove into this, having seconds and then thirds. Really yummy. On a very sad note though, it is an RIP for my Silpat. I left my hungry hubby unsupervised and he CUT THROUGH IT with a butter knife while trying to get himself more pizza. I'm crushed. ;) He promised he'd get me a new one though. 1. 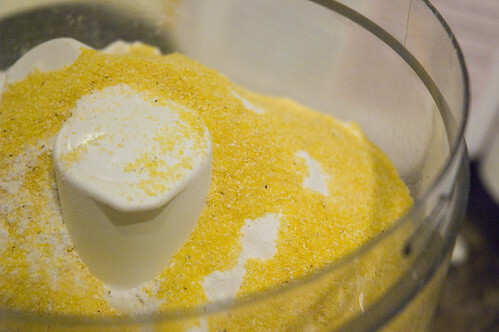 Combine the yeast, flour, cornmeal and salt in the container of a food processor. 2. Turn the machine on and add 1 cup water and 2 T olive oil through the feed tube. Process for about 30 secs,m adding more water, a little at a time, until the mixture forms a sticky ball. If it's too try, add another tablespoon of water (if too wet, sprinkle in a little more flour). 3. 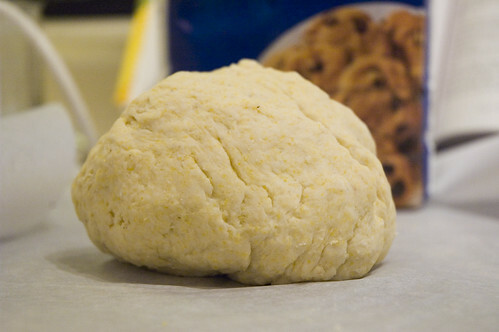 Turn the dough onto a floured work surface (I like parchment paper) and knead by hand a few seconds to form a smooth, round dough ball. 4. Grease a bowl with the remaining olive oil and place the dough in it. Cover with plastic wrap or a damp cloth and let rise in a warm draft-free area for about 1 hour (I think my yeast is toast because mine never really rose that much). 5. At this point, you can make pizza, or freeze your dough for up to a month. May I suggest pizza? I used this to make one large rectangular pizza (about 11x17 inches). 1. Preheat oven to 450F. Spread out your pizza crust on a greased rectangular cookie sheet (if you're lucky enough to have a baking stone or pizza peel, use that and adjust accordingly - I presume if you have one, you should know how to use it....if you don't, feel free to pass it along! hahahahaha). Use patience to get the dough to spread. The gluten needs to relax, so give it a few tries. 2. Brush your crust with olive oil. Then top with sauce. 3. 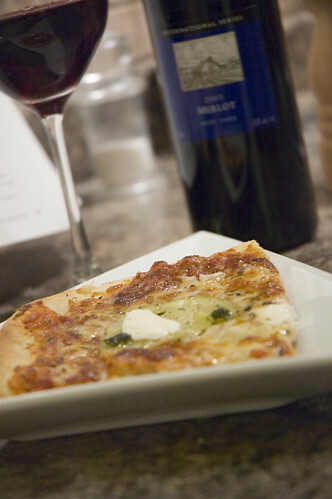 Sprinkle cheese over pizza - I grate my mozzarella coarsely, and use a fine grated for the additional cheeses. I like a blend of cheese, but you could forgo the others in lieu of just mozza if that's to your taste. 4. Sprinkle your cheesy pizza with italian seasoning. 5. Top with potato slices and minced onion, then add dabs of persillade and crème fraîche. 6. Bake for 10-12 minutes. Keep an eye on your pizza and make sure the toppings are done to your liking (I like my cheese browned, some people prefer it runny). Enjoy! I suggest wine. Actually, no, I command wine. Yummy I love your blog! I am trying to save up money to go to vegetarian culinary school and I will definetly be using your blog to practice new things! I hate the traditional "american" pizza...so anything that is a little off the beaten path, I love to try it. I will be making this pie on Wednesday! Thanks! my copy of 'how to cook everything' is so well-worn that it almost needs to be replaced. a definite staple in the cookbook department. thanks for all the great recipes! my husband and i have been trying to eat less meat and having interesting vegetarian recipes to try definitely helps!